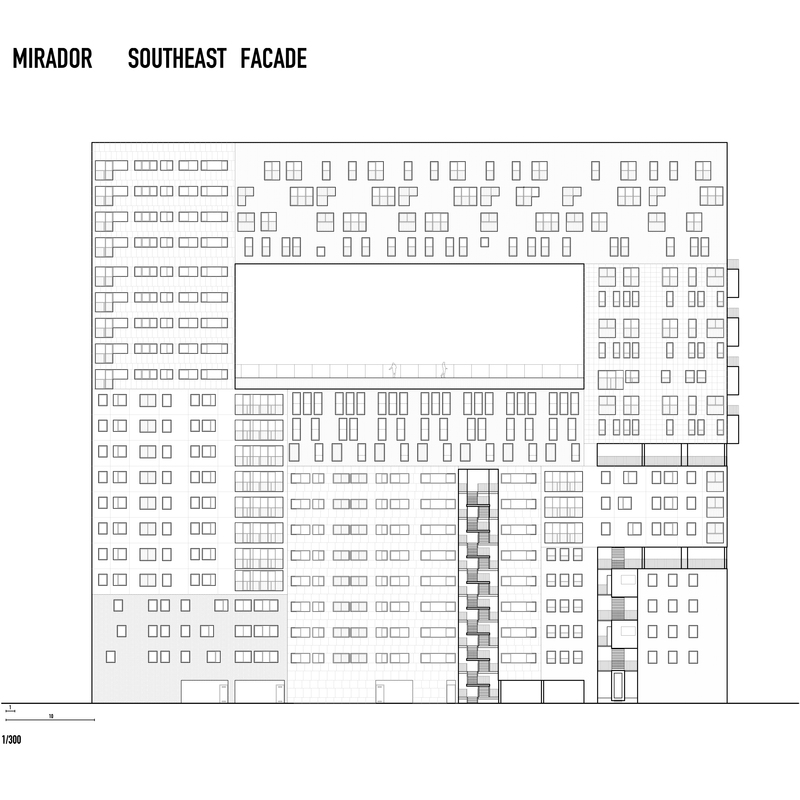 Mirador is a collection of mini neighbourhoods stacked vertically around a semi-public sky-plaza. The building acts as a counterpoint against the massive uniformity of the surrounding housing blocks. It frames the distant landscape of the Guadarrama Mountains through a large ‘look out’ located 40 meters above the ground. This also provides outdoor space and community garden for the occupants of building, monumentalising public life and space. In PAU de Sanchinarro, one of the new cities situated on the north eastern edge of Madrid, two plots are destined for development as a possible ‘escape’ from the uniformity and claustrophobia of a surrounding filled with six-story blocks. In the first, the typology of houses surrounding an inaccessible patio is turned sideways creating a communal space with a view of the city, and the Guadarrama Mountains. The tower preserves open space needed by the modern city. The large lookout space, 40 meters above the ground, provides occupants and neighbours with a community garden and a space to contemplate the skyline. The proposal opens domestic architecture to the new city environment and to its surrounding territories. The semi-public sky plaza is easily accessible with a direct lift connection from the plaza surrounding the building. This lifted public space is surrounded by different neighbourhoods, a wide variety of compact housing types integrating different social groups and lifestyles. In contrast to the mass-produced repetition of the standard family house, these housing units are grouped into small blocks that are stacked and glued together, create a towering community superblock. The slits in between the blocks act as access zones and are conceived as vertical alleys. Their transformation along each itinerary agglomerates the compendium of typologies that are structured like small suburbs. It leads to a vertical sequence of stairs, halls, platforms, and streets. It creates a vertical neighbourhood. It becomes the reference point of the neighbourhood. The allowance for the realisation of this building can be seen as a sincere and honest manifestation of Spanish self-criticism, an admirable character trait. Perhaps it is an elementary one, especially for a culture that wants to be open, vivid, and cosmopolitan.